I remembered the words written down on the business card the owner of the hotel I stayed in Mumbai gave me: a Home away from Home. Even though I prefer food that hasn’t travelled half the globe, I can perfectly understand why people want to have a piece from Home where ever they go, may it be in form of a grocery store. When you are an immigrant you learn to value the new things you find at your new home, but you also realise that the old things never taste like they used to “back home”. In my case this means that every winter I try to hunt down tangerines and every summer I try to hunt down watermelons that come all the way from Turkey. One thing from my India trip I remember vividly, is the Delhi-Mumbai flight I took with Air India. Oh, I enjoyed every bit of it .. the chaos at the airport, my conversation with the lady at the check-in counter who initially sent my baggage to the wrong airplane, the interested stares and smiles from the passengers, and the huge meal … a huge portion of delicious okra and the hottest green chilli pepper I have ever tasted. The okra dish made me realise that we in Turkey have a way of turning everything into a torture :) Okras can get very slimy when they touch water. 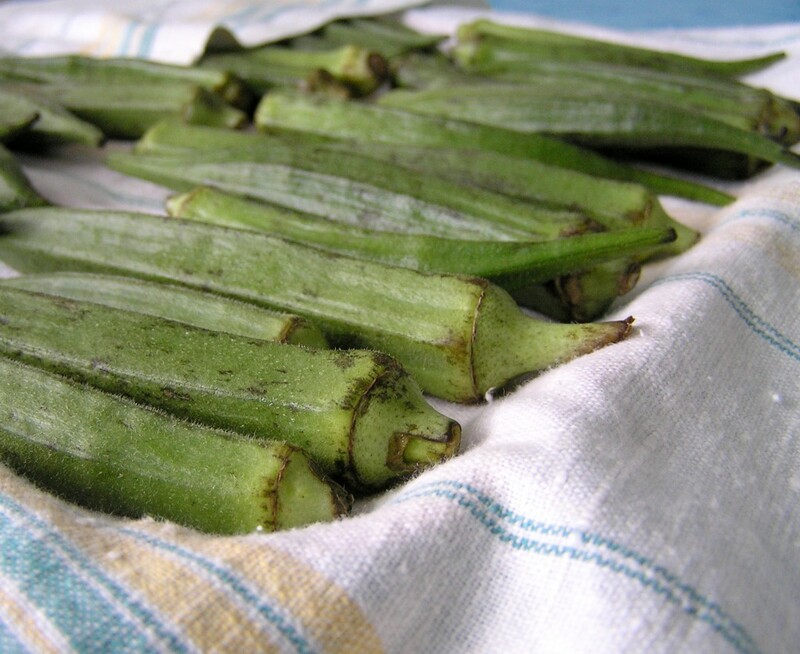 So, in Turkey, we buy the tiniest of Okras so that we don’t have to cut them and later we spend ages to scrape away the brown edge around the stem without damaging the Okra itself. That way the inside never touches water and we end up with a nice, slime-free dish. In India, the Okras are huge. They do cut them but don’t use water while cooking. Simple solution. 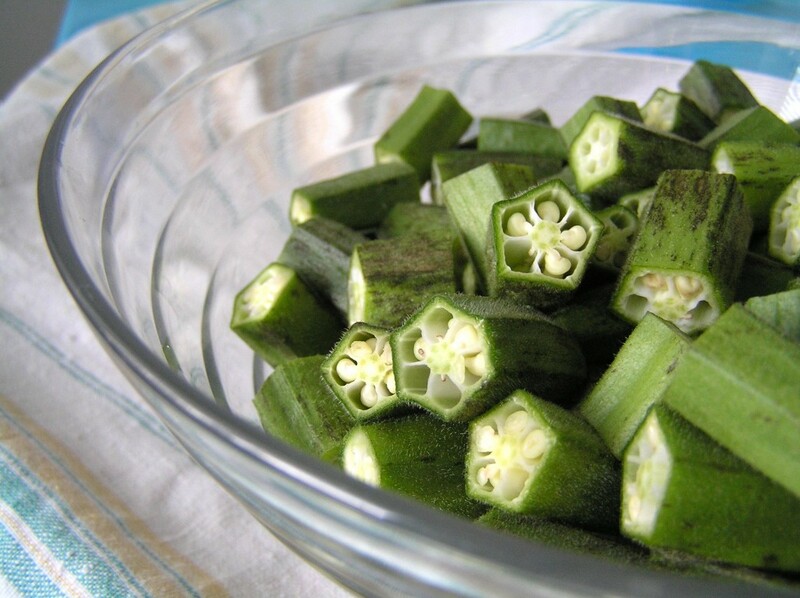 Wash your okras a few hours before you want to cook them so that they have time to dry completely. Chop them into small pieces of ca. 2 cm. Once the okras are tender put them out of the pan and set aside. Put another 1-2 tablespoons of coconut oil in the pan and add the pea flour. Stir it for about a minute and add the tomatoes. Now add all the spices and the yogurt. Bring the mix to a boil. If it gets too thick you can add some milk ( I used about 1/4 cup of milk ). Now you can add the okras into your sauce and let them cook on low heat for about 20 minutes. I am not a fan of Okra but of Indish food. If there is a possibility I will choose Indish food or at least Asian. Thanks for sharing! Ohhh! I’m not a big fan of okras, but this sounds good! 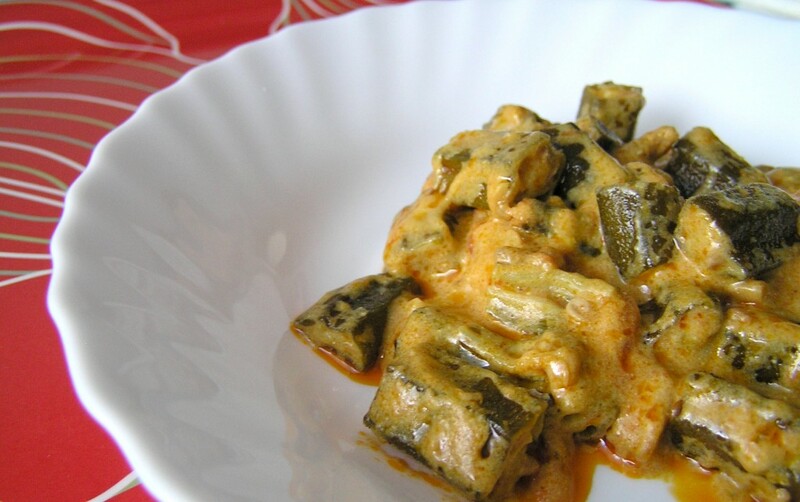 The curried okra looks so good. I’m going to ask my mum to make that for lunch today! Even through I’ve lived in India all my life, I’ve never visited the Taj Mahal. A pity, I know!